Join us at our annual meeting for a maple syrup grading contest. Bring some of your syrup and see how it stands against other sugar makers' product. All entries must be produced in the past year by the person entering the contest and become the property of the Maple Syrup Producers Association of Connecticut. Maple Syrup entries must be submitted in a pint size sealed plastic or glass syrup container and will be placed by staff in coded glass containers without names for judging. All Entries must be identified appropriately with sugarbush name, producer name, address and syrup grade, by means of a sticker, tag or printing direct on the container. Only one entry per person per category will be accepted. Entries must be produced by MSPAC members from trees and cannot be blends. No points given for decorative containers, ribbons, etc. Judge participants may not participate in the contest. There are four criteria used in judging the quality of maple syrup. These are density, color, clarity, and flavor. The score includes: 30 points for density, 20 points for color, 10 points for clarity, and up to 40 points for flavor – for a total of 100%. Before judging begins, samples of syrup should be shaken to equalize density throughout the sample and mix up any sediment. These guidelines are according to IMSI standards. 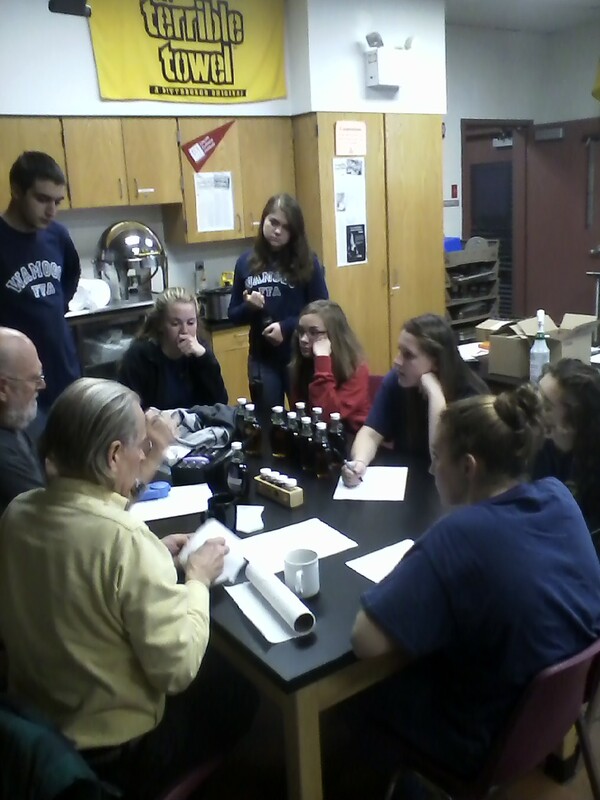 Caption: Members Bob Dubos and Wayne Palmer as well as some Wamogo students grade syrup for our 2016 contest. 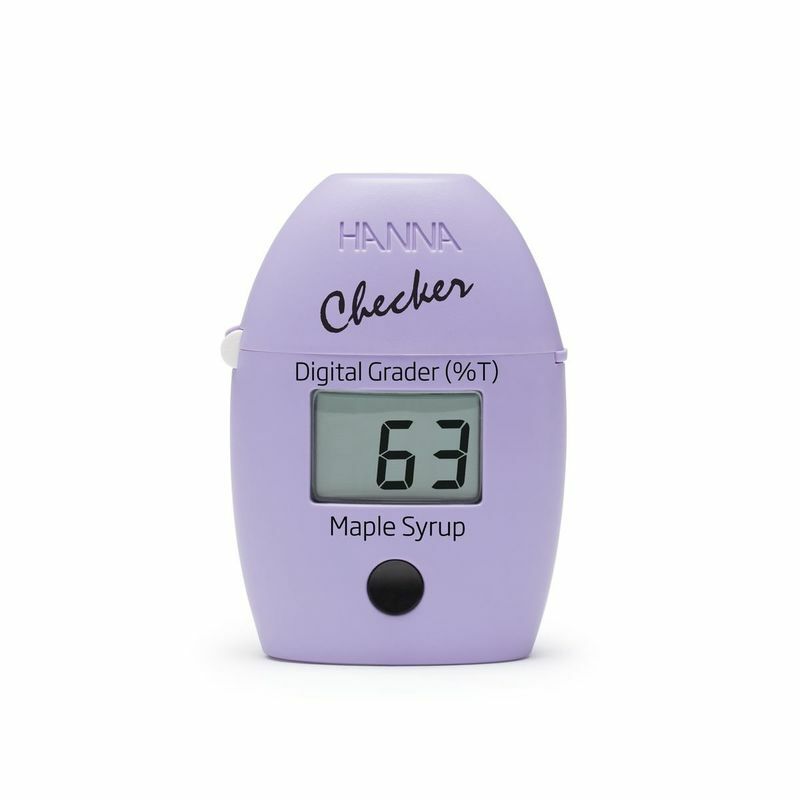 A Hanna digital grader is used to grade the syrup at the contest. Maple syrup has a unique flavor that sets it apart from other specialty foods. It's characteristic for exhibiting different subtle flavors depending on when it was produced, where it was produced, and, at times, how it was produced make it a product that everyone, regardless of their taste preferences, can enjoy. However, this characteristic also makes syrup flavor susceptible to flavors that are not considered typical. These off-flavors can occur anywhere from the tree to the containers. Not only do production methods affect the flavor, but Mother Nature has a hand in it too. Following are some common off-flavors that have been encountered, their likely causes, and ways to avoid these problems. product may have a salty flavor. Detergents - The only detergents that should be used in syrup production are ones that are approved for food use and approved specifically for maple. Producers have often used products that are designed for home use, damaging the flavor of the finished product. People also submit samples of syrup for contests in used glass jars that have retained a soapy flavor. A detergent flavor in syrup may taste soapy, or have a perfume odor or flavor, depending on the type of detergent used and if any rinsing was done. Rust Preventative Paints - In the past, many producers painted the inside of galvanized sap buckets and holding tanks to prolong their useable life. Usually a rust preventative paint was used, often containing a fish oil base. This type of paint should never be used on any surface that is in direct contact with sap or syrup. There are very few products acceptable for food contact surfaces and most require a specific application process and an extensive drying time. The flavor derived from this material may have an oily taste and feel on the tongue, similar to cod liver oil. It is especially prevalent if the paint was not cured completely before using the bucket or tank. Metallic - This off-flavor usually is the result of prolonged storage in metal syrup cans or storing bulk syrup in poor quality metal barrels. Always check the interior condition of galvanized and epoxy coated barrels and do not use any with obvious rust or cracked epoxy. The recommendation for metal syrup cans is to only pack what will be sold in a three month period. A metallic off-flavor affects the sides of the tongue, a sharp feeling that almost feels like your tongue is going to water, but it doesn't. It may affect your teeth like biting a piece of tin foil. If the exposure has been prolonged, the product may have a greenish tinge to it and it may taste "tinny". Plastic - The type of material that causes this off-flavor is most often a nonfood grade plastic or a plastic not meant for exposure to hot syrup. Using the wrong type of pail to move syrup from the evaporator to the filter or packaging syrup in containers not designed for hot filling creates a bitter flavor or a flavor that tastes the way some plastics smell. New filters: These are the type of filters that use the weight of the syrup to filter, usually a hat or cone type or flat filter. During the manufacturing process, these filters pick up and retain a slight chemical odor and flavor. Before use, they should be boiled in clear water and dried thoroughly. If not, they impart a chemical flavor to the syrup. as they may pick up detergent residue in the fibers. After the season is over, filters should be washed in water and dried thoroughly before storing in a dry location free of contaminating odors. Filters not dried thoroughly will mold, creating musty off-flavor when hot syrup is filtered through them the next season. Never store filters with mothballs, as this will create a chemical off-flavor that tingles in the mouth and on the tongue. Defoamers - Many different products are used to reduce the foaming of the boiling sap during evaporation. Commercially available vegetable fat derivatives, either liquid or powdered, butter, milk, or vegetable oil are often used. Only a small amount is needed to control foaming and using too much will create an off-flavor in the syrup. A defoamer off-flavor may taste like whatever was used for defoamer and have an oily or waxy feel on the roof of the mouth and on the tongue. Chemicals - The technology used in producing syrup today often requires the use of powerful cleaners and preservatives. It is very important to follow the manufacturer's recommendations carefully and rinse thoroughly before continued use. A chemical off-flavor will affect the entire mouth and may get more objectionable with breathing in and out. The off-flavor usually relates to the smell of the chemical used. Lubricants and Fuels - Care should be taken to avoid contamination of the sap or syrup from exhaust fumes or improperly operating equipment. Also, only food grade lubricants should be used in any pumps or equipment that comes in contact with sap or syrup. Off-flavors attributed to this type of contamination will taste just like the contaminant smells. Often a strong odor in the product will be a sign of an off-flavor present. Musty - This off-flavor can become present in the syrup in two ways - from putting hot syrup through filters that contain mold spores or from poorly sealed containers. The musty off-flavor tastes yeasty or moldy and usually has a moldy odor. It is most noticeable on the back of the tongue and in the throat. Ferment - Fermented syrup usually develops from one of two problems with the product. If syrup has not been boiled enough to concentrate the correct amount of sugar, then the syrup may work like apple cider. At times, we find correct density syrup fermented and that is usually from syrup stored in barrels that have not been properly cleaned. Even barrels that have been previously steam cleaned may have moisture in them that have revealed yeast, mold, and bacteria in great numbers. Syrup that is fermented will have a sickening sweet flavor, at times a honey like similarity. Depending on the type of ferment, it may have an alcoholic or fruity taste. Severe ferment may have a foamy appearance. Sour Sap - As the weather warms near the end of the sugaring season, sap left in a tank begins to warm, basically beginning to spoil the sap. Syrup made from this sap has a ropy appearance when poured. The flavor is very sour and leaves a slimy coating on the roof of the mouth and tongue. Burnt Niter - When sap is boiled, minerals that are in the raw sap precipitate out of the solution and form niter that collects in the compartment in the front pan where the syrup is being drawn off. To prevent this from becoming a problem, the producer switches draw-off sides as needed, or changes front pans if the evaporator is constructed in that manner. If this is not done, a build up occurs in the pan, creating a combination off-flavor. The syrup will have a burned taste from the niter rising off the front pan and the syrup burning, and it will also have a niter flavor, which has a slightly fizzy affect like baking soda on the tongue. Scorch - This off-flavor is a burned flavor in the syrup with a very strong bite on the tongue and in.the throat. Operating the evaporator with too Iowa level of product in the front pan actually burns the syrup. Earthy fIavor- Tapping into punky wood, dark colored or stained areas in the tree, or cracked wood produces syrup with this off-flavor. The flavor tastes and smells like garden soil. Care should be taken while tapping to avoid the potential for this problem. Mother Nature Off Flavors - The resource itself, the maple tree, and the environment contribute to the next two off flavors. Even though they are naturally occurring, they damage the normal maple flavor and are considered unacceptable in maple syrup. Metabolism - This is an off-flavor that is attributed to changes in the metabolism of the tree due to a warming of temperatures. This can be present at any time during the sugaring season, from the first run on. Usually a change to colder temperatures reverses it's effect on the finished syrup. This is mostly speculation from working with syrup for many years and research is being done to determine the exact cause of this problem. A metabolism off-flavor robs the product of most of its maple flavor. The resulting flavor has been described as woody, peanut butter, or popcorn. An almost cardboard like flavor may be present. A chocolaty smell may be detected. Buddv - Buddy syrup is usually produced during the late season, depending on the weather conditions present. The tree begins to produce buds, and the sap takes on a distinctive quality that is transferred into the syrup. Usually the production of this type of syrup signals the end of sugaring for the season. Buddy syrup usually tastes chocolaty, almost a tootsie roll type flavor. If very strong, it may take on a bitter chocolate characteristic. An odor of chocolate may be present, but not always. Breathing in and out normally intensifies the flavor. Vermont Department of Agriculture, 1986.